Emotion and time perception are in constant interaction in everyday life activities. While growing literature explored the mechanisms underlying emotional timing, the neural correlates remain unknown. The present experiment explored evoked-related potentials associated to the estimation of emotional sounds duration and to its modulation by attention. Electroencephalographic activity and skin conductance response were recorded during a time estimation task, in which participants were instructed to attend either to time or to emotion. Attending to emotion increased autonomic arousal and lengthened subjective duration of stimuli. Conversely, focusing attention away from emotion decreased physiological arousal and shortened time estimates. ERP results showed that subjective time dilation was associated to enhanced amplitude of the Contingent Negative Variation - a slow negative wave involved in time processing. 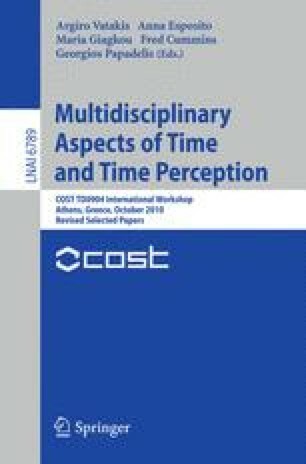 This result supports models of time perception assuming that subjective time is based on an accumulation process in the brain.